I grew up as a reader, but I was a steadfast reader of fiction only–especially series. I remember receiving my PSAT score report in high school, which strongly suggested that I begin reading more nonfiction in order to improve my vocabulary and reading comprehension. So, not being informed about the wonderful nonfiction tomes I now know about, I began to read the newspaper. That probably contributed to my majoring in journalism, and now teaching that subject in addition to English. But it wasn’t until I took Penny Kittle’s class at the UNH Literacy Institute in 2013 that I fell in love with nonfiction (pardon me, Mr. Lehman and Ms. Roberts!). I read Malcolm Gladwell’s Outliers and was enamored of his use of narrative to help me understand seemingly disparate facts. I quickly read all of Gladwell’s other books, then devoured the rest of the booklist from Penny’s class–The Emperor of All Maladies by Siddhartha Mukherjee, The Immortal Life of Henrietta Lacks by Rebecca Skloot, Behind the Beautiful Forevers by Katherine Boo, Zeitoun by Dave Eggers, and plenty more. However, it’s not since Gladwell that I’ve found another nonfiction author whose collected works I’m dying to devour…until now. I recently asked my students to brainstorm as many nonfiction genres as they could, then select three for us to focus on for this quarter. One of their selections was a recipe. 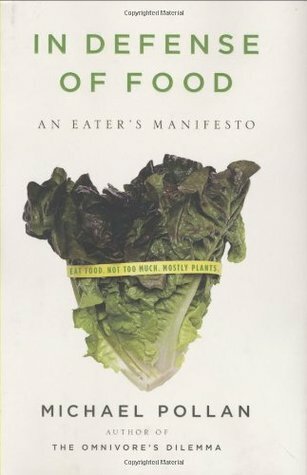 I wanted to show my students lots of examples of writing about food, so I purchased Michael Pollan’s In Defense of Food: An Eater’s Manifesto and The Omnivore’s Dilemma: A Natural History of Four Meals. I picked up In Defense of Food first, and was left defenseless. This book rocked my world, and my worldview. It’s a book about the food we eat, where it comes from, how it’s different than other cultures’ foods, and how it’s good and bad for us. I learned about the wild inaccuracies of food science, the nutrient-depleting process of processing food, and the government’s allowance of all this because of their dependence on food marketers’ money. I also learned about the evolution of America’s food culture–from farm fresh to TV dinner to fast food–and its deleterious health effects on our population. So, after Pollan sufficiently freaked me out and made me swear to myself that I’d never eat any processed food again in my life, he presented a clear solution to my fretting and outlined some rules for eating healthily (the subtitled Eater’s Manifesto). I learned how to shop smart, defy the American diet’s unhealthy customs, and consider my foods in the contexts of their meals, which can completely transform their nutritional value. It wasn’t just the topic that fascinated me (admittedly, I love to cook)…it was the writing. From knee-slappingly incredible food puns like “let them eat Twinkies” and “the silence of the yams” to his deft skill at citing other writing to support his own arguments, I was convinced. The clear organization of the book mirrors his three basic rules about eating well, which he states in sentence number one: “Eat food. Not too much. Mostly plants.” The complex narrative he weaves makes perfect sense, but is incredibly layered. Through it all, Pollan made his claims and supported them sturdily, leaving me not only swept up in a great story, but thoroughly knowledgeable about what real food is and isn’t in America today. I can’t wait to bring this book to my students through book clubs, a reading challenge, or a craft study mini-lesson…so I’ll booktalk it tomorrow to my Funyun-munching students with as much fire and brimstone as I can manage, and hope they hop on the Pollan diet with me. I’m dying to read this now! I’m sure I will severely regret my food choices (like that cupcake I had for lunch), but given your review, that’s exactly what I need. Good Morning, Shana. This may be a silly question, but how does a reading challenge differ from a book club? Good morning Lisa! That’s not a silly question. I usually differentiate the two in lots of ways, but the main one is that book clubs are in groups while challenges are individual. So, a nonfiction book club involves multiple students reading a book of their choice in that category, and a nonfiction challenge might have every student reading a different nonfiction book. I absolutely loved this book too! If you liked In Defence of Food, you should read Jonathan Safran Foer’s Eating Animals. I certainly will! Thanks for the suggestion.